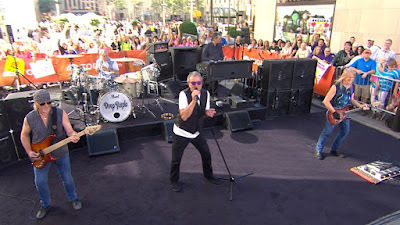 Deep Purple performed their 1972 signature track, “Smoke On The Water”, on NBC's Today show at New York City's Rockefeller Plaza on Thursday. The band are currently playing shows on a summer tour of North America and are gearing up for an August 28 release of a pair of live albums. “From The Setting Sun… (In Wacken)” sees the group captured in concert at Germany’s Wacken Open Air Festival in 2013, while “…To The Rising Sun (In Tokyo)” presents the group live at the Nippon Budokan in Tokyo in April of 2014. “One band, two crowds, two countries – a tale of two cities indeed,” says bassist Roger Glover. "From Germany’s Wacken Open Air Festival, one of the biggest metal festivals in the world – and a city unto itself – to Japan and the stately Nippon Budokan, the most revered venue in Tokyo. Each with its own distinct personality." “From The Setting Sun… (In Wacken)” and “…To The Rising Sun (In Tokyo)” will be available on 2CD+DVD, DVD, Blu-ray (Tokyo performance), Blu-ray 3D (Wacken performance) and 3LP Gatefold.